Systemic lupus erythematosus (SLE) is a rare connective disease affecting 6-19 cases per 100 000 children. The neurological manifestations are seen in 25-95% of patients with SLE more commonly in the form of headache, psychosis, or cognitive dysfunction. , In up to 1-2% of patients with SLE it may be complicated by transverse myelitis but rarely acute transverse myelitis may be the initial manifestation of SLE. We present one such case where ATM was the initial and only manifestation of SLE. A 13-year-old Polish girl, previously fit and well, presented with history of pain in the left leg for 2 weeks progressing to bilateral weakness of legs and sensory loss. She was febrile for 2 days prior to admission. She had constipation and urinary retention. There was no history of trauma, recent vaccination, cough, skin rash, joints pain, oral ulcers, or any other clinical symptoms or signs suggestive of SLE. On admission to hospital she was afebrile with normal vital observations and blood pressure. Examination of her cardiovascular and respiratory system was unremarkable. Abdominal examination revealed distended abdomen as a result of constipation and urinary retention. Neurological examination suggested normal cranial nerve examination with no bulbar palsy. The motor power in the lower limb at presentation was 3/5 MRC with areflexia. The motor power was 5/5 MRC in the upper limbs with brisk tendon reflexes. There was sensory loss from T4 below. In the next 24-48 h the motor weakness increased with complete weakness in the lower limbs and power deteriorating to 3/5 in the upper limbs. She was diagnosed with acute longitudinal myelitis and started on intravenous-pulsed methylprednisolone for 5 days followed by oral prednisolone in tapering doses. Blood results at presentation showed normal biochemistry but elevated CRP of 42 mg/L. (normal range 0-10 mg/L) The complete blood count was normal except for low lymphocytes of 0.77 × 10 9 /L. MRI spine [Figure 1] showed multi-focal multi-regional transverse myelitis involving spinal cord from C5 down to the conus. Extensive investigations were carried to identify the underlying cause. Cerebrospinal fluid (CSF) showed elevated white cell count (WCC) of 1570 × 10 6 /L with predominant polymorphs and elevated protein of 0.78 g/L. All the cultures including blood, CSF, and urine were reported as no growth. The virology screen was negative including Lyme's serology. Anti nuclear antibodies (ANA) was positive with the titres being 1: 1600 and showing a speckled pattern. At this point pediatric rheumatology opinion was sought to rule out an auto-immune condition or a connective tissue disease leading to transverse myelitis. Rheumatology evaluation did not reveal any other signs suggestive of SLE or any other connective tissue disease. She did not satisfy the Americal College of Rheumatology (ACR) criteria for diagnosis of SLE. A further auto-antibody screen revealed significantly elevated double-stranded DNA antibody 355 iu/mL. Anti-Sm antibody, anti-U1 antibody, and anti-RNP70 antibody were positive. C3 and C4 were low. Immunoglobulin profile showed elevated IgG and IgM levels. Cardiolipin antibody and lupus anticoagulant were negative. Aquaporin IgG antibody was negative. The lab markers were suggestive of SLE but with no convincing clinical features to correlate. She was transferred to local tertiary pediatric rheumatology unit. Based on the overall clinical picture and immunology markers, she was commenced on IV cyclophosphamide which was continued for seven cycles. She also underwent three cycles of plasmapheresis as treatment for SLE with ATM. After completion of IV cyclophosphamide cycles, she was commenced on azathioprine, oral prednisolone 10 mg once daily along with hydroxychloroquine. Initially, she needed subcutaneous enoxaparin therapy which was changed to Aspirin once she started mobilizing. She had neuro rehabilitation in the form of intensive physiotherapy, support from the occupational therapy. She received botox injection in the lower limbs for her spasticity. Over the following few months she made significant recovery. Her repeat MRI of spine [Figure 2] done 16 months later has shown complete resolution of the inflammatory changes. She was able to walk with the use of crutches to move around and uses wheel chair only for long distances. She self-catheterizes her bladder and has normal bowel movements with intermittent need for Movicol. She has normal motor power in the upper limbs and she has normal sensations both in upper and lower limbs. She has re-integrated back at her normal mainstream school. After 18 months of treatment with immunosuppressants and oral steroids, she has not developed any other clinical features of SLE. In those cases where ATM is the presenting feature of SLE, many may not fulfil the criteria for the diagnosis of SLE but over the course of the disease they may eventually present with other signs and symptoms of SLE. In our reported case although the ANA and double-stranded DNA antibodies are positive, the patient has not shown any other clinical features of SLE. It is likely that the clinical course has been altered with on-going immunosuppression. Investigation may reveal raised inflammatory markers in blood as well as CSF. ,,, The auto-antibody screen may show antibodies positive suggesting SLE but with no clinical features to correlate. The diagnosis of SLE is made after excluding other possible causes of ATM and with lab data suggesting SLE. MRI is very useful as it shows the extent of involvement and also helps rule out other causes of myelopathies. It usually shows high signal in T2-weighted images. Our patient presented with neurological signs suggestive of acute longitudinal myelitis but no clinical markers which would suggest SLE. She fulfilled the ACR criteria for 3 out of 11 criteria but immunological markers were highly suggestive of SLE. CSF showed non-specific inflammatory changes with raised WCC and protein. She was diagnosed early and treated aggressively which may have helped the outcome. The involvement may be limited to one particular segment or involve a long length of the spinal cord. 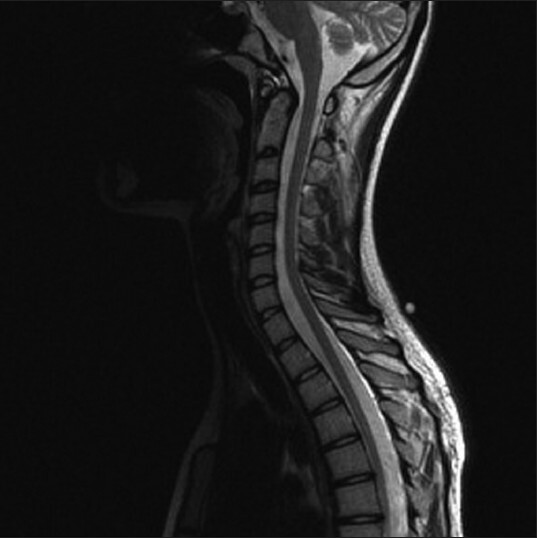 Our patient had almost complete involvement of spinal cord from C5 to conus with a small area near T10 being spared. There have been reports that in those where more than four segments are involved, a high proportion of them have varying degree of disability after treatment. They also may show greater degree of inflammation in CSF and sensory involvement is more frequent. , Our patient showed reasonable recovery following aggressive treatment. MRI scan done 16 months after presentation showed complete resolution of T2 changes in the spinal cord. Acute longitudinal myelitis can be a devastating condition as it limits one's quality of life. Rarely ATM may be the presenting feature of SLE. ATM secondary to SLE can carry a poor prognosis despite new treatment approaches and the treatment needs more than just steroids. Early detection and aggressive treatment can prevent long-term permanent damage and may even have a favorable outcome. This report emphasizes the need for multi-center trials and the creation of a registry for SLE patients with ATM to help study optimal management options. Paediatric Urology team, Leicester Royal Infirmary, UK, Paediatric Neurology team, Birmingham Children's Hospital, UK, Tertiary Paediatric Rheumatology Unit, Birmingham Children's Hospital, UK. 1. Avcin T, Benseler SM, Tyrrell PN, Cucnik S, Silverman ED. A followup study of antiphospholipid antibodies and associated neuropsychiatric manifestations in 137 children with systemic lupus erythematosus. Arthritis Rheum 2008;59:206-13. 2. Silverman E, Eddy A. Systemic lupus erythematosus. In: Cassidy JT, Petty RE, Laxer RM, Lindsley CB, editors. Textbook of Pediatric Rheumatology. 6 th ed. Philadelphia: Saunders Elsevier; 2011. p. 328-30. 3. D'Cruz DP, Mellor-Pita S, Joven B, Sanna G, Allanson J, Taylor J, et al. Transverse myelitis as the first manifestation of systemic lupus erythematosus or lupus-like disease: Good functional outcome and relevance of antiphospholipid antibodies. J Rheumatol 2004;31:280-5. 4. Vieira JP, Ortet O, Barata D, Abranches M, Gomes JM. Lupus myelopathy in a child. Pediatr Neurol 2002;27:303-6. 5. al-Mayouf SM, Bahabri S. Spinal cord involvement in pediatric systemic lupus erythematosus: Case report and literature review. Clin Exp Rheumatol 1999;17:505-8. 6. Espinosa G, Mendizábal A, Mínguez S, Ramo-Tello C, Capellades J, Olivé A, et al. Transverse myelitis affecting more than 4 spinal segments associated with systemic lupus erythematosus: Clinical, immunological, and radiological characteristics of 22 patients. Semin Arthritis Rheum 2010;39:246-56. 7. Lopez Dupla M, Khamashta MA, Sanchez AD, Ingles FP, Uriol PL, Aguado AG. Transverse myelitis as a first manifestation of systemic lupus erythematosus: A case report. Lupus 1995;4:239-42. 8. Linssen WH, Fiselier TJ, Gabreëls FJ, Wevers RA, Cuppen MP, Rotteveel JJ. Acute transverse myelopathy as the initial manifestation of probable systemic lupus erythematosus in a child. Neuropediatrics 1988;19:212-5. 9. Kovacs B, Lafferty TL, Brent LH, DeHoratius RJ. Transverse myelopathy in systemic lupus erythematosus: An analysis of 14 cases and review of the literature. Ann Rheum Dis 2000;59:120-4. 10. Chen HC, Lai JH, Juan CJ, Kuo SY, Chen CH, Chang DM. Longitudinal myelitis as an initial manifestation of systemic lupus erythematosus. Am J Med Sci 2004;327:105-8.